Nicki Minaj is explaining why she’s canceled two shows so far on her Nicki Wrld Tour in Europe. The 36-year-old “Chun-Li” rapper posted an update to her Instagram on Sunday morning (March 10) after canceling her Bordeaux, France show at Arkea Arena on Saturday (March 9) just a few weeks after canceling her Bratislava, Slovakia show at Ondrej Nepela Arena on February 22. “You guys, it’s not in my best interest not to perform and lose money and aggravate my fans. I love performing for my fans,” she explained. “I’m more excited than you are before the show. These two cities that had technical issues were cities I’d never been to before. We tried to add them, but they just didn’t have the power in the building to facilitate my show and they didn’t tell us that until three hours before the show as opposed to once we did sound check, they said that it was fine,” she said. Posted to Cardi B, Kenneth Petty, Nicki Minaj, Young M.A. 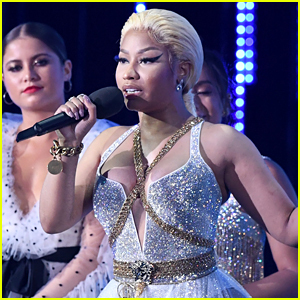 Nicki Minaj is calling out the Grammys after a fan pointed out that she deserves to be a winner following a long career in music already. The producer who Nicki is referring to is Ken Ehrlich, who Ariana Grande called out for lying after he said she couldn’t get a performance ready in time for this year’s show. They actually had a dispute over the song she would perform. Here is a list of 18 artists who shockingly have never won at the Grammys.